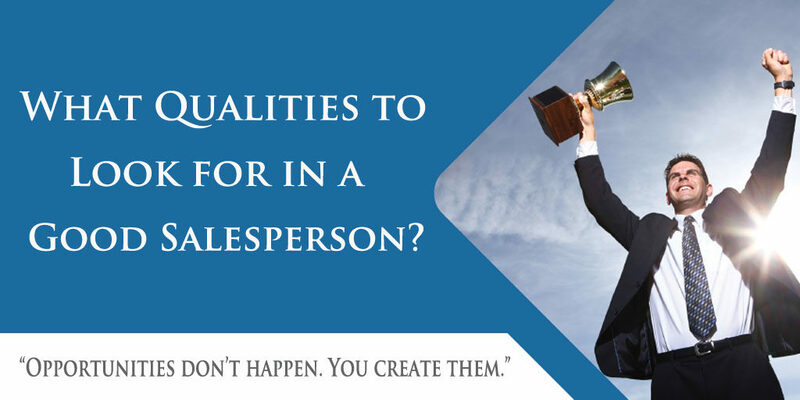 What Qualities to Look for in a Good Salesperson? Home > Hiring Tips > What Qualities to Look for in a Good Salesperson? You started a business, and now you are looking for a salesperson to sell your product or service. But do you know what qualities to look for in a good salesperson? Hiring a good sales manager is very important for any business or firm. Before taking interview take some time and think that what type of salesperson will help your business to grow more. Here, we are listing some points to keep in mind when you are looking for a salesperson. Sells is a job where a salesperson needs to interact with customers, sometimes he needs to convince them too. He should be polite and helpful, If your customers will feel comfortable with him they would like to come again. A good communicator asks questions to know the opinions of customers, they understand what people are thinking. This makes people feel that say truly matters. If you want to increase your sells then consider this quality as an important one. Optimism is very important in a good salesperson. In this field, many times a person needs to face rejection. Failure and Rejection can make person disappoint and some people give up and resign from the job. Rejection is very real part of selling a product, especially when focusing on cold leads. A good sales manager isn’t easily discouraged and doesn’t take the rejection on a personal level. Positive emotions make you more curious. you explore more, take more initiative. He should believe in the product he is selling, be confident and move to the next customer with more energy. Listening is a hard skill to develop and if you find this in someone then hire him/her immediately. A salesperson needs to listen to the customers all the queries and question very carefully. you need to care what customer wants to say, In short, he/she should be good in listening instead of speaking. Prospects will always give you some clues as to what they are think and feeling about you and you product or services. He needs to care what customer wants to say, In short, he should be good in listening instead of speaking. A sales job is not only about selling, but it is also about handling your workplace single-handed. He/she should be able to take calls and answering customers question at the same time. Generate your own leads and make relationship with customers, it will help you to generate more sales and references. Take follow-ups of your clients yourself about product or service. They are happy with your product/service or not. A sales manager should have some goal to achieve and be focused on his work. Every act needs careful attention in order for it to be executed effectively. Poor results are usually the result of poor focus management, and it doesn’t matter who did it. Time will be spent regardless of whether or not you are focused. But focus is the determinant of how well you goal. Focused person is self-motivated and can organize their work by themselves. They need less advise than others. Consider all these points while you are looking for a salesperson and hire a good salesperson to make your business grow like never before.